Find and eliminate problem frequencies in certain guitars and amps, shape broad mid 'scoops' or boost anywhere on the mid spectrum to suit any style. Plug straight into the front of an amp as a standalone drive pedal, or plug into the effects return to make the donor amp 'disappear!' Whatever your rig, the possibilities are virtually limitless. 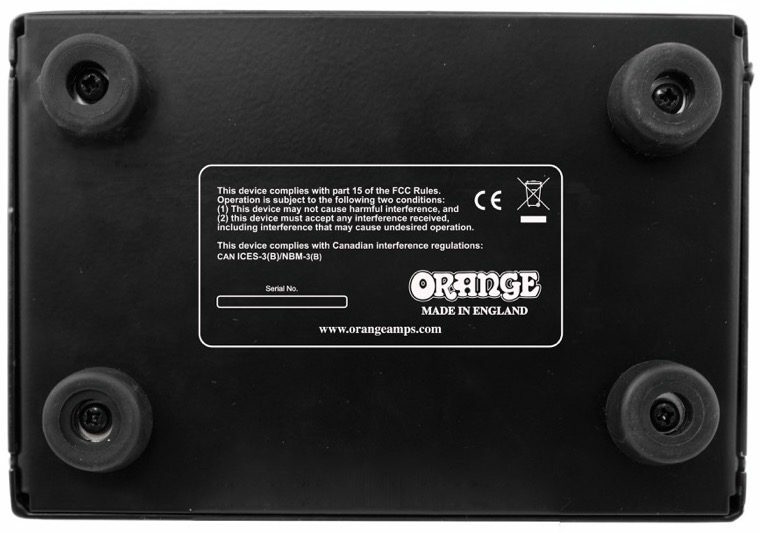 For even more flexibility, the second output takes your sound and passes it through Orange's CabSim circuit, recreating the frequency response of a mic'd Orange 4x12" cab, ideal for direct recording or even connecting to a PA. Whether on stage or in the studio, the nature and scope of its controls mean there isn't a situation where the Bax Bangeeter wouldn't be welcome. 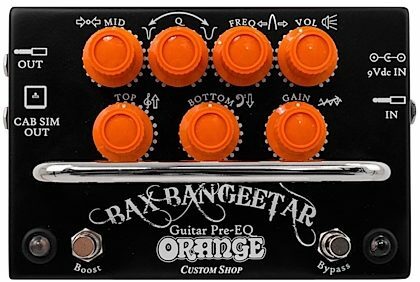 The Bax Bangeetar is an entirely new design, not based on anything Orange has made previously. The gain structure covers a massive breadth of overdrive and distortion without ever sounding compromised, however you set it. 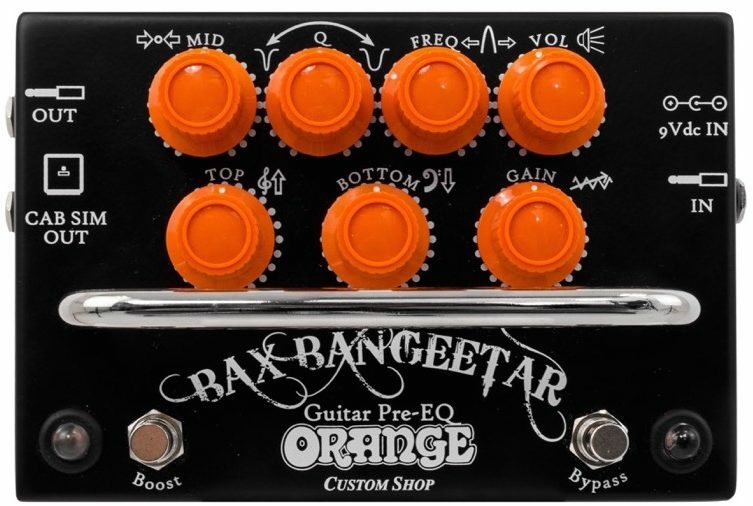 At the minimum, the Bax Bangeetar is an awesome clean boost or low gain driver, highly receptive to different guitar and pickup combinations. As the gain increases, you'll go from classic Orange crunch and vintage rhythm tones, through to soaring leads and right up to genuinely insane levels of distortion. As in, bonkers levels. 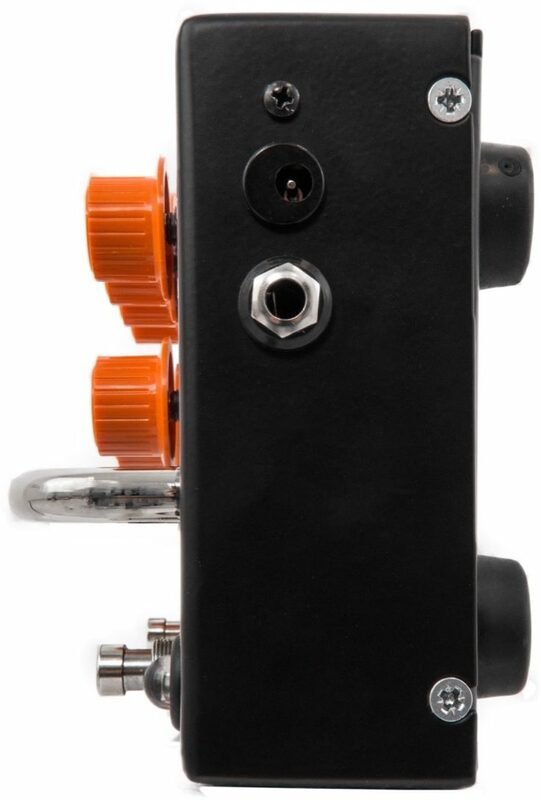 The Boost switch offers a 'clean boost' after the gain stage when the pedal is engaged to help your leads jump out of the mix in a live setting. 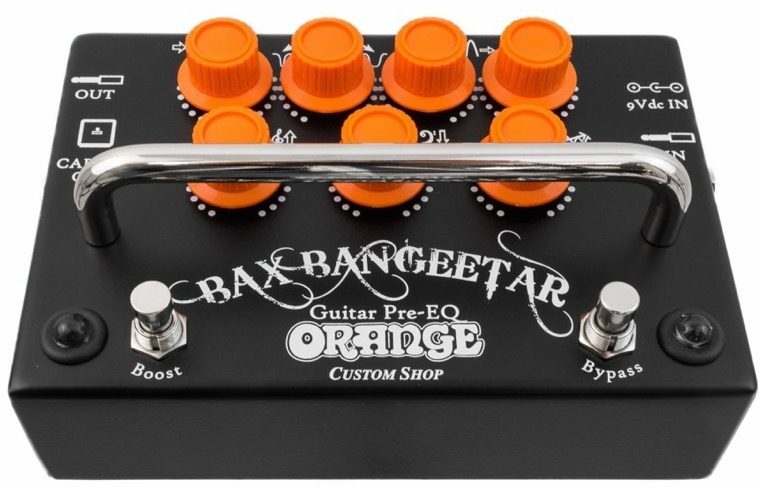 As soon as you plug into the Bax Bangeetar, you'll quickly notice that all the sounds contained within remain articulate and tight across the gain range, without any hint of wooliness. In fact, it doesn't feel like a pedal at all. We've achieved all of this without the use of the back-to-back diode clipping techniques found in most pedals. 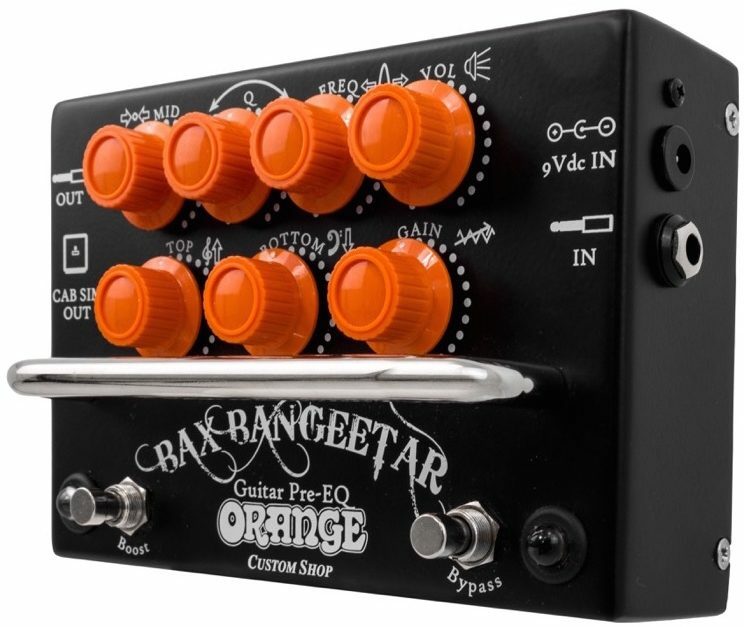 This box distorts and behaves just like Orange's amps, with natural-sounding and controllable breakup, and delivers serious punch with no stifling compression. Inspired by some of the highly-sought after consoles of the 1960s but with a number of modern tweaks, the Bax Bangeetar's powerful EQ really separates it from other drive pedals. With an open treble response and controlled low end, the fun properly starts with the mid controls. The midrange is perhaps the most important area for guitar players, not only because this is generally the space they occupy in a band mix, but also because of how the midrange drastically affects the tonal and distortion characteristics of a guitar/amp setup. Despite this, we've found that most overdrive/distortion pedals have very limited control over this range. Not so with the Bax Bangeetar's fully parametric mid controls. The 'Freq' knob selects the center frequency you wish to affect. The 'Q' controls the bandwidth, sweeping from narrow to wide, allowing you to fine-tune a precise or broad frequency range. The 'Mid' knob can then be set to cut or boost those frequencies, for exact command over your tone. "Is it 'true bypass'?" No. It's better than that. 'True bypass' is well-intentioned but is not without limitations. 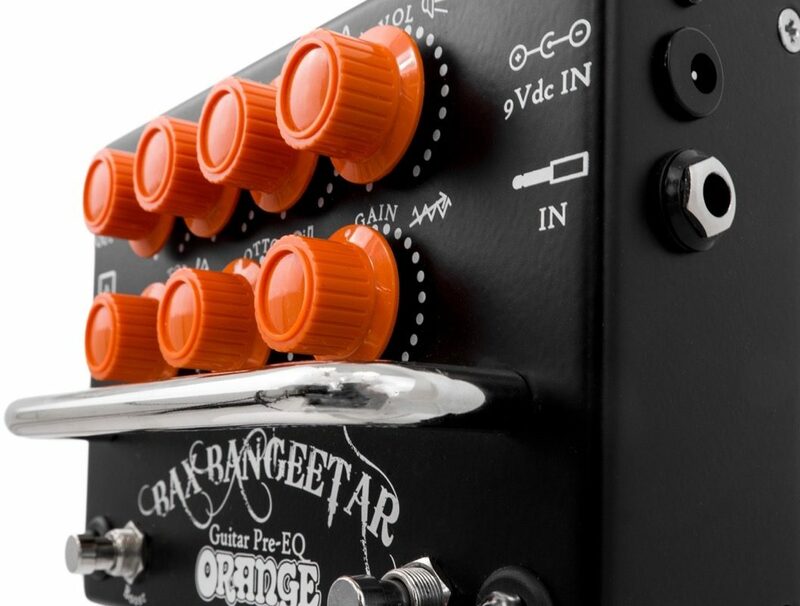 Orange's supremely linear buffer circuit is designed for the growing number of discerning players who realize the positive effects that a studio-quality buffer can have on their overall tone. Whether you need to drive a pedal board or just need a little help getting a pure signal to your amp, buffered bypass ensures no degradation and no loss of clarity or high end. Placed first in your chain, you'll sound better, even when the pedal is off! Key to the design is Bax Bangeetar's charge pump which doubles the internal voltage to 18V from a 9V source. This is not only crucial to the bypass circuit, but also means this pedal has a wider dynamic range and more output, with even greater definition and headroom than a conventional 9V pedal. The second output takes the Bax Bangeetar's preamp and passes it through Orange's CabSim circuit, faithfully emulating the sound of a mic'd Orange 40th Anniversary PPC412 412 cabinet, loaded Celestion G12H 30 speakers. Connect the CabSim output to a recording console to capture huge Orange tones in the studio, or to a powered monitor or PA for a versatile live setup. Both the regular and CabSim outputs can be used independently or simultaneously. - Highly transparent buffered bypass. - Power: 9V battery operation or 9V-12V DC adapter. Overall: KILLER!!! KILLER DILLER MILLER!!! I was very concerned about the high price being asked for such a small device just to do what I figured any quality EQ could probably do just as well. Wrong! After hearing this monster I almost forgot what I paid for it. This is by far the best effects pedal on the market in this price range and well worth the money, and the tones this thing can produce is almost unearthly. I'm about to go play soon as I fill out this long form. Style of Music: Rock 'n' roll, blues rock, southern rock, hard rock, R&B, jazz and slow burner blues.